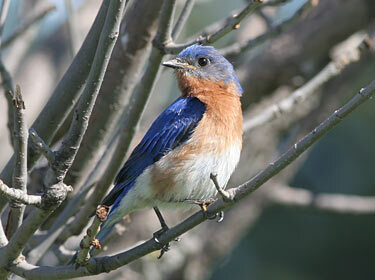 Description: Uniformly deep blue above; orange-red throat, sides of neck, breast, sides, and flanks; contrasting white belly; white undertail coverts. Female is duller overall. Juvenile is brown above; white below with brown mottling; and has blue on wings. 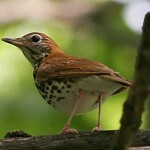 Habitat: Breeding birds favor open hardwood forests, especially those bordering grasslands. 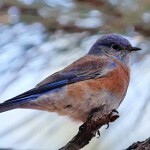 Breeding birds and migrants can also be found in forest edges, shelterbelts, city parks, and farmsteads. 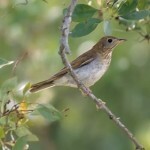 Where in Nebraska: Spring and fall migrant across the state, most common in the east and rare in the extreme west. Common summer resident in eastern areas, and local breeder in the west. Status: Serious population decline in recent decades due to competition with Starlings and House Sparrows for nest sites. Specially designed nestboxes and concerned birdwatchers have resulted in a promising comeback.